Time management in the VA work – 7 major time management tips. Correct time management is based on the essential amount of efforts directed to achieve the results from the activities. 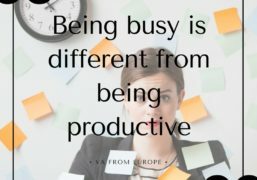 The main principle of a good time management is the truth that being busy is different from being productive. Trying to finish plenty of tasks frequently leads to a low productivity. 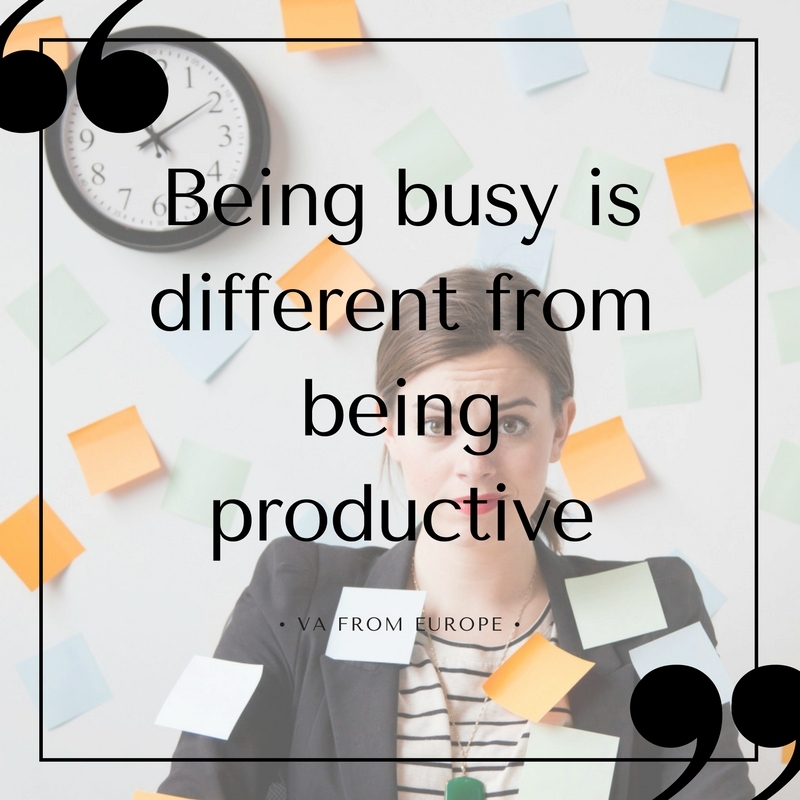 Virtual assistants from Europe know that smart time management gives you a chance to arrange your work wisely without making it harder. Specialists of Virtual assistant from Europe prepared 7 major time management tips, so you can accomplish more tasks spending less time! Planning, setting deadlines and adhering to the timetables are included in a list of simple necessities of working process, and these would help you to set priorities. This strategy permits you to concentrate your time and efforts on the most important things to start with instead of spreading your energy on many small and easy tasks. Such planning builds your profitability, because critical goals and activities have a tendency to be completed at first. Accomplishing tasks according to a schedule and organizing your goals diminishes stress. Adhering to a plan helps you to get the feeling of taking control over your time. It also helps to concentrate your efforts far from wasting your time or insufficient problems. Agenda works as a suggestion and motivation to do things by a definite time, it helps to avoid unexpected situations and feeling of anxiety. Time management is more than simply setting plans and creating timetables. It is about disposing or even preempting distractibility and inattention while working. Correct time management also includes planning of communication process in a workplace. Ask your colleagues if they have any inquiries and plan when you can spend some time on it. Such organizing can save a lot of time. Buy a personal organizer and fix all of your tasks, goals and meetings for a week. Such practice can help to analyze the amount of work which can be completed and the time you have to spend on each task. You can realize which amount of time is spent on getting productive results and how much time is wasted on ineffective things. Any work or communication that is valuable for your success ought to have an appointed time for it. Schedule really works. Plan meetings and devote time for priority tasks, discussions, and activities, plan the time they will start and finish. Take the control over all your arrangements. At least a half of your time should be occupied with actions, thoughts and meetings which let you achieve the maximum profit. You need some time for pauses, consider this while planning. Don’t let people interrupt you. Plan a time when you are able to have conversations. The initial 30 minutes in the beginning of your day are to make plans for this day. Try not to begin your day until you finish time scheduling, the time for making plans is the most important time of the day. Learn how to ignore the phone ringing (when it is not an important call) and messages every time they appear. You’d rather plan special hours for checking your mail and for telephone calls. Do not use social media while working. Of course, if it is not connected with your business directly. Keep in mind the fact that it’s difficult to complete everything in time. But if the 20 percent of your overall activities gives you 80 percent outcome, you have a great chance to succeed. Follow these useful major tips, keep calm and you’ll see how your time management skills create a positive influence on your productivity. “Find Your Focus Zone” by Lucy Jo Palladino, “Eat that frog” by Brian Tracy, “The Power of Habit” by Charles Duhigg, “Getting Things Done: The Art of StressFree Productivity” by David Allen, “How to Get Control of Your Time and Your Life” by Alan Lakein.